February will bring us an extremely nice book, called 3-Minute JRR Tolkien: A visual biography of the worlds most revered fantasy writer. It is one of the books I was lucky to be reviewing and I must say it is one of the better looking books on Tolkien I have seen in a long time. As Peter Jacksons cinematic hobbits set forth, 3-Minute JRR Tolkien celebrates the enduring influence of the worlds most revered fantasy writer. It offers a readable, absorbing structure, dividing J.R.R. 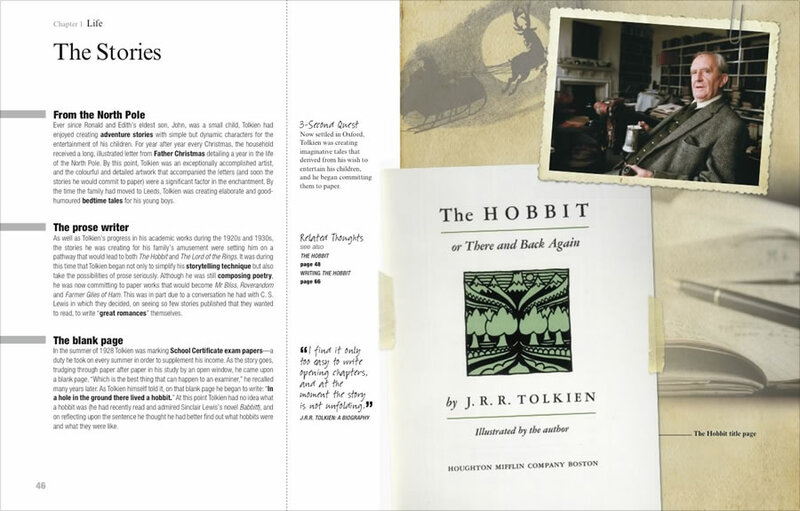 Tolkiens life and cultural contribution into 60 neat portions, every one digestible in a mere three minutes: 20 mini-sections each on Life, Work and Influence. From a childhood inventing new languages in the sylvan landscape of the Severn valley, through a First World War that saw him witness the horrors of the Somme, to academic success founded on a passion for Old English tales, we trace Tolkiens life and look at the way in which it informs his creation of imaginary worlds so intricately mapped that modern readers, writers and artists continue to explore them in a quest for their myths, monsters and meaning. I was lucky to be speak about the book with Gary Raymond, the author and Tolkien artist John Howe, who wrote the foreword. Hope you all enjoy the interview and perhaps even pre-order the book, since it is a must have for any Tolkien lover! TL: Can you tell us a little about yourself? Gary Raymond: I’m a writer, critic and academic from Wales. I am one of the founding editors of the Wales Arts Review, which is the main cultural criticism website in Wales. I write articles on a wide range of subjects. The Tolkien book is actually my first foray into the field of fantasy – although I approached the subject as I do any other: from the point of view of an admirer of the artistry of the work. I don’t really think in genres to that extent. I’ve written works and lectures on subjects as diverse as George Orwell, Emily Dickinson and Christopher Nolan’s Batman Trilogy. I’ve also just finished my first novel which hopefully should be out before too long. TL: What did you like to read when you were a child? What were your bigger inspirations? Gary Raymond: I suppose I was a fairly unusual child in the fact that I didn’t spend too much time on children’s books. I graduated quite quickly, for which I give full credit to my grandfather who used to read me Sherlock Holmes and Edgar Allen Poe short stories when I was still sucking my thumb. I remember the first book I read on my own that was not a children’s book, and that was an unabridged Penguin Classic print of Dracula and I was about eight or nine. I recall vividly finishing it on a Sunday afternoon in my grandfather’s conservatory. It sounds quite pretentious, but the truth is it seems to me a very natural progression, going to classic gothic horror, from the first thing I remember getting me excited on the page, which was Roald Dahl. I think I’d read everything of his, and memorised entire passages from his Revolting Rhymes. In primary school I was a member of a book club – one of those fabulous in-class mail order things I’m certain no longer exists – and this introduced me to wonderful illustrated abridged versions of The Count of Monte Cristo, a hefty paperback of Watership Down and Spike Milligan’s children’s books and poetry – I remember Unspun Socks from a Chicken’s Laundry in particular. TL: When did you read The Hobbit / The Lord of the Rings for the first time and do you still recall this moment? Gary Raymond: I read The Hobbit before I was ten, I’m sure. And The Lord of the Rings in my teens, which must have been quite a common evolution from one work to the next. I still have that first copy of The Hobbit that I bought with saved-up pocket money from a great little bookshop in my hometown of Newport in South Wales (a bookshop long gone, like most of the others in the town). It’s a little Unwin Paperback with a wonderful sweeping landscape painting on the front by Roger Garland. I know Tolkien had some issues with the covers of many editions of his book, approving of his own choice artists, but I remember my eyes spending just as much time locked on the exterior of the book as a ten year old as they did on the pages within. And that’s not to say The Hobbit didn’t enchant me. The Lord of the Rings was a different experience altogether. It seemed very serious. But the vastness is what influenced me the most – this idea Tolkien had that we were being allowed to read about one adventure in a vast living breathing world, and around every corner were other characters, other adventures. That is what made it so strikingly real to me; it was not enclosed. In many ways the story of The Hobbit is one of these ‘other’ stories. Obviously in The Lord of the Rings we are witnessing a world war – that affects most people. Apart from those in the Shire (until the very end when Saruman attempts to bulldoze it). Not many non-fantasy writers would openly cite The Lord of the Rings as a big influence on their fiction, but I’d say that the sheer absoluteness of Tolkien’s creation has influenced me immensely. TL: I'd like to talk about your book, 3-Minute JRR Tolkien: A Visual Biography of The World's Most Revered Fantasy. What prompted you to write the book? Gary Raymond: It came about mainly through conversations with the publishers. I’d read A.N. Wilson’s biography of C.S. Lewis a number of years ago and it had drawn me in to the Inkling’s universe. A few years ago a playwright friend of mine had a production on at the Oxford Playhouse so I used the opportunity to walk around Magdelene College, and have a pint of two in the Eagle and Child and get a bit more of a feeling for the world of Tolkien outside of his creations. It was a long process but I was getting the feeling I wanted to tackle the subject of Tolkien, or maybe one of the others, for some time before the opportunity came up. As soon as I started working with Ivy Press on the initial idea it all seemed right. TL: The 3-Minute book concept is unique and this book is part of a series, can you explain us about the concept? Gary Raymond: Prior to the Tolkien book the series has dealt mainly with scientific subjects – a book on Einstein for example. It’s an attempt to give an introduction to a subject in a fresh way, accessible but also intellectually engaged – the way the information is broken down means that it is actually more detailed and intense than many other books I have read on the subject. What you don’t get is the novelist’s narrative – which I think is a good thing. Many biographies spend a great deal of time on the characterisation of their subject, which, as a fiction writer myself, I know is utterly susceptible to manipulation. In this case I think Tolkien comes across as an extremely likeable figure, but that’s because he most likely was, not because I’ve tried to paint him a certain way. The book is in three parts: Life, Work, and Influence. And those three parts are broken down into further sub-chapters that tackle important aspects of the subject. The idea is that every sub-section should be digestible in 3-minutes, so the information is concentrated and easy to store. There are so many books on Tolkien out there, but none like this one. It’s a lot of fun, as well; it was to write and it is to read. TL: The introduction by John Howe is called Myth-making for the modern man, it seems to be trying to give the answer why we all love Tolkien? Gary Raymond: I think John’s introduction is excellent. It puts Tolkien where he deserves to be, which is in a prominent position in the intellectual development of myth in humanity’s progress. Nobody played a greater role in that in the modern age than Tolkien. He is as important as Homer was to the ancients, as Virgil was to Rome, as Milton was to the Reformation. The question as to why we love Tolkien is the same as why we love myth. Myth belongs to us and yet is so mysterious also. Myth comes from us, goes out into the world and mixes with the light and dark, then comes back to us as an unknowable yet familiar entity. John Howe: I do truly believe that it all hinges on telling stories. Myth, when it was still religion, told worldstories, of creations, of the reasons why things were not perfect, and of humanity’s place in the world, and our responsibilities. Now that myth is just myth, we relate it in often incomprehensible and abbreviated forms, we reduce complex deities to simple representative of the elements or the planets, or we do the opposite, attribute much to ancient gods that their own creators never intended, if it serves our proper agendas. One of the values of Tolkien is that he places the things communicated by much myth once again in story, so that we “understand” without expostulation, itemizing, explaining, we grasp something in the reading, something that most would be hard-pressed to define, but which is definitely transmitted in the margins of the storytelling. TL: Tolkien seem to have borrowed a lot from mythologies and influenced many others. Does this make him such a popular writer? John Howe: Tolkien’s borrowing from myth is more akin to a tree that takes water and minerals from the earth and gives us branches and leaves to admire. It’s never simply a retelling, but very close to the spirit of many mythological tales, with an element of tragedy and loss – the happy end that is bitterwseet – that speaks very strongly to the modern reader. Gary Raymond: I think the fantastical binds humanity across the globe and across the ages. Every civilisation (and even the less civil) have had fantasy. Tolkien didn’t exploit it, he was as much allured by it as his fans have become. Tolkien is no different to the campfire storyteller. He’d have created stories had he been a Bedouin poet at a campfire side beneath the Saharan stars, or an ancient Greek poet orating tails of Trojan heroism on the steps of the Parthenon, whatever. Tolkien is popular because he is as passionate as about these tales as we are. The fact that publishing them was at best an afterthought makes his writing even more successful, because he had no interest in second-guessing the fans or the genre. TL: What sources did you use to write your book? Gary Raymond: So many. Carpenter’s biography was a good starting point. But to create something like this book you need much much more. The most important in terms of reference were Christina Scull and Wayne Hammond’s Companion Guides. To be honest, I think they are two of the most impressive works I have come across in any field of literature. They are remarkable creations, worthy of Tolkien’s own impressive ingenuity. There is the Chronology and the Reader’s Guide and they come in at somewhere around a few thousand pages of painstakingly collated, arranged and referenced material on just about everything you would ever need to know about Tolkien, from the genealogy of the Balrog to the subject matter of a lecture Tolkien gave to twelve spotty undergraduates on a wet Thursday afternoon in 1956. An amazing achievement. TL: What special qualifications do you have for making this study? What makes you different from your colleagues? Gary Raymond: I lecture in English and Creative Writing at University of Wales, Newport, and I’m a cultural critic and editor. I suppose my expertise as a scholar of literature qualifies me; but also my insight into the creative process, as I’m a fiction writer, maybe gives me a perspective I wouldn’t have if I were primarily a scholar or primarily a novelist. 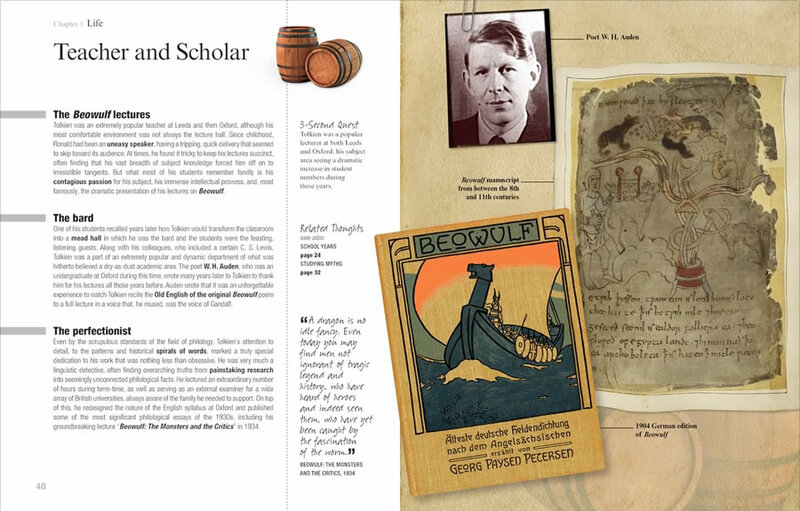 TL: How does this book compare to any other biography on Tolkien? Gary Raymond: Well, it’s not just a biography – it begins that way but it branches out to the point where, in fact, it covers just about every aspect of modern culture. That’s how far I think Tolkien reaches, even at his faintest. But he is there, where you would least expect to find him. The book goes into those far corners, so there are moments of real curiosity, and maybe, even though it’s an introduction, the book has been researched well enough that it will throw up some new elements to seasoned fans. Plus it is in many ways a coffee table book, beautifully designed and presented, with some glorious artwork and images. The publishers, Ivy Press, have done a great job. 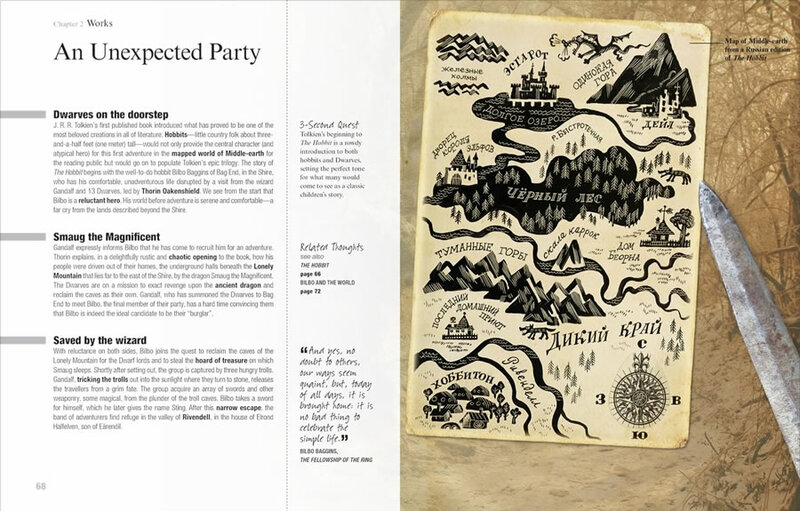 It is a unique book in Tolkien-ology. TL: And how does your book compare to Humphrey Carpenter's J.R.R. Tolkien: A Biography? And what is your idea about that book? Gary Raymond: I think Carpenter’s book is a fine biography. It’s a straight chronological narrative that tells the ‘story’ of Tolkien in a traditional format. My book is certainly not that. If I was to recommend Carpenter’s book I would say it is a good introduction to the man, but in a very different way to the book I have written. In many ways 3-Minute Tolkien goes much deeper into Tolkien, and goes much further after Tolkien’s death, right up to detailed analysis of Peter Jackson’s films, and looks at gaming and fantasy art, all from the starting point of Tolkien. Actually I think it’s strange that nobody has come along and written a grand sweeping narrative of Tolkien’s life. Carpenter’s book ended up feeling quite slight to me. Some biographers have written far better books looking at specific periods of Tolkien’s life, such as John Garth’s book on Tolkien during The Great War. TL: What is your hope for your readers? 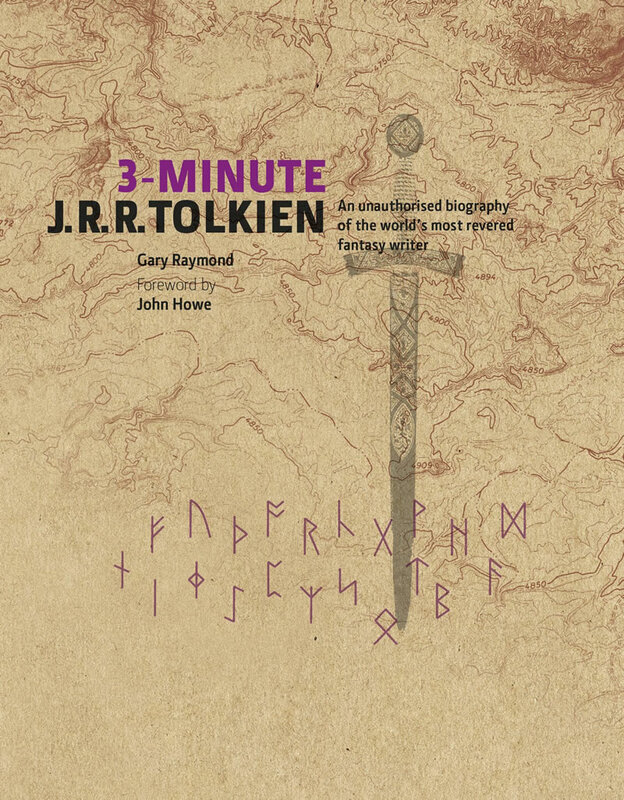 Gary Raymond: I honestly think the 3-Minute Tolkien is the type of publication that could become cherished. It is a beautiful item. The love of fans has gone into it, which I think Tolkien would have liked. As I said before, I think it has enough for newcomers and fans. It tells Tolkien’s story, but also goes quite deeply into his work and goes even further into the influence he has had on so many aspects of modern culture. It goes beyond the obvious shadow he casts over the genre he did so much to help create. TL: When working on the research, did you discover new things about Tolkien? Something unexpected? Gary Raymond: Quite a lot, actually. I would not have considered myself an expert on Tolkien at the outset, just a fan, but I knew I’d have to become an expert in order to see the project through, so I found out a great deal about the man. I also found out a great deal behind works of his with which I was not familiar, such as his later short children’s work. But the biggest blank spot for me was the world of gaming. I knew nothing about it at all, really. I had Hero Quest as a board game when I was very young, but could never understand the rules and just used to smash the goblin figures together. So researching that was both fascinating and daunting. And the stunning artwork of fantasy artists such as John Howe and Alan Lee, and also Frank Frazetta’s powerful Death Dealer paintings. TL: Do you, just like me, find Tolkien's live and personal story as interesting as the books he created? Gary Raymond: Well, interestingly, Carpenter, in his biography goes as far as to say that popular opinion has it that almost as soon as Tolkien became a renowned and popular writer his story all but ends. Carpenter sets himself the challenge of debunking this myth. Tolkien’s rather enclosed life amongst the cliques of Oxford academia says as much about the man as had he gone on adventures or become some kind of extrovert celebrity. Tolkien’s life was concerned almost entirely with the mind, with cerebral pass times, and there’s no way he could have created his epics had he not spent so much of his time at his desk and in libraries. There is no narrative there that lends itself so easily to drama, or even to biography. But the truth is, that to me suggests that Tolkien’s work is inseparable from the man – in the same way that Tolstoy’s fiction is an aspect of the development of his proto-humanism and mystical philosophies. So you can take from Tolkien a cerebral insight into a spiritual, humanist, ecological and mythopoeic philosophy of a man who may not have seemed so remarkable had you met him at a bus stop. So for that, if for nothing else, Tolkien is a fascinating figure. He is a testament to the strength and energy of the human intellectual imagination. I also like the boyishness of him. In many ways Tolkien was always that little boy who was in the Birmingham Oratory trying to let loose in rather rigid societal conditions. It’s no accident that he found an outlet in fantastical fiction. The cloisters of Oxford are not that different from a Catholic orphanage. TL: In a sentence or two, why should people buy this book? What makes it stand out? Gary Raymond: It’s a collector’s item. It is a fun but studious look at Tolkien’s life, work and influence that will appeal to almost anybody who has an interest in modern culture. TL: The book is full of pictures, photos and art, do you think this will appeal both adults and kids? Gary Raymond: I think it certainly will. Tolkien’s creations are so visual in many ways, and of course nowadays the images of Middle Earth are a significant part of cinematic language, and cinematic language has become a part of our cultural language, so Tolkien plays a part in the very fabric of how we view the world. So, for me, a book about Tolkien that was not vivid with artwork and images would be missing much of the point of the man and his influence. As far as this book goes, it has the added appeal that it is quite playful as well. It is not pretentious or po-faced. The first thing I thought when I saw the finished versions was just how much Tolkien would have liked it. Of course, he took his work very seriously, but he also had a wonderful sense of humour, and this book too, is serious and fun. TL: You are connected to the University of Wales, how do you see Tolkien's connection to Wales? Gary Raymond: Tolkien was an obsessive of European myth, of course, and particularly that kind of mossy, pastoral mythology – obviously the Nordic myths, but also the Celtic and Anglo-Saxon stories. I liked the story of Tolkien watching the coal trains coming through Edgbaston, where he lived for much of his childhood, from the mines of the Welsh valleys, each locomotive marked with the exotic Welsh place names such as Nantylgo, Penrhiwceiber and Senghenydd – you can immediately see (or at least hear if you read them aloud) the influence such a language had on Tolkien’s later work. Of course it melded with his later loves and studies of Icelandic and Finish cycles. But he had a connection to the landscape and the Mabinogion (the most famous cycle of Welsh myths). There is a Tolkien walk you can take through the Black Mountains that points out many of the places he visited and walked and some of the landscape is very striking for the scenes from his work it brings to mind. TL: Just out of curiosity, do you have any Tolkien books in your house and what is your most precious one. Gary Raymond: I have piles of them – many purchased whilst researching this book. But my most precious, I think, would probably be that first little pocket paperback of The Hobbit I bought from that long gone bookshop in Newport. It may be only twenty five years old, but it is one of those items in life that cuts through the mist and connects me directly to my childhood – the feelings from looking at the painting on the front, the print, the well-thumbed pages. The Hobbit, for so many millions of people, is not just about Bilbo Baggins, but is something about ourselves, I think; something about an introduction to the possibilities of imagination. Most of us don’t get to visit that place very often as we grow up – but having that little paperback is as precious as it gets, I suppose. John Howe: I have many more books about Tolkien than books by Tolkien, I have to confess. Most of the copies of his books that I have are ones with my covers on them, so they are archived somewhere. I do have an annotated Hobbit, though, and my old copies of the Lord of the Rings somewhere. They are filled with tiny sketches and notes in the margins that I made in art school. I also have much-thumbed copies of The Monsters and the Critics and Tree and Leaf. TL: One final question. Did you go to see The Hobbit movie by Peter Jackson and how did you like it? I did, and I enjoyed it very much. I think it’s Jackson’s best film, and I’ve been watching him Bad Taste. I think Jackson and his crew have learned many lessons and put some things right that have dated in the short time since his Lord of the Rings came out. But when you put yourself on the edge of technology things get found out quickly. There are some moments in The Hobbit when he may be at the risk of repeating himself, but I think he actually has the pacing better, the tone is more enjoyable, and, because of the nature of the source material, the story is more focussed and cinematic. What he did with The Lord of the Rings was remarkable, but I just got the feeling he’s made a better film with the first instalment of The Hobbit. And he seems to have actually done a better job than Tolkien did of uniting The Hobbit and The Lord of the Rings tonally and thematically. That was the big test and he’s past it. Most critics who are giving it a hard time are judging it (incorrectly in my opinion) on two criteria: is it as good as we wanted it to be, and how did the 48fps turn out? I think Jackson’s The Hobbit is a triumph and a better cinematic experience than The Lord of the Rings, mainly because The Hobbit is an adventure story, which is what cinema does best. I do think, though, that Peter will create a lasting legacy with his cinematic treatment of the dwarves, in a similar manner that Tolkien did with Elves. Before Tolkien, elves were a much-diminished nursery rhyme race; Tolkien retrieved something of their grandeur that is hinted at in the Eddas and other older texts, restoring a dimension that had largely disappeared under a patina of Victoriana. What Tolkien started as a whim will find its accomplishment with Peter’s film trilogy – the “ves” in “dwarves” as opposed to an “f”, will make its way into English dictionaries eventually, I’m sure. Most neologisms are technological; it’s reassuring to see one that will be mythological.